The Tyler Prize Executive Committee is pleased to recognize Sir Partha S. Dasgupta as the recipient of the 2016 Tyler Prize for Environmental Achievement for his scientific contributions to the field of environmental economics. Dasgupta is the Frank Ramsey Professor Emeritus of Economics at the University of Cambridge. The Tyler Prize is the premier international award for environmental science, environmental health and energy, recognizing leaders working at the forefront of environmental disciplines since its inception in 1973. In addressing many of society’s most pressing global environmental challenges, economics has moved to play an increasingly central role. 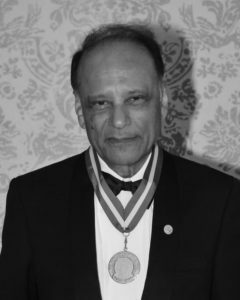 The 2016 Tyler Prize for Environmental Achievement recognizes this complexity and honors the pioneering work by Dasgupta in establishing new paradigms at the nexus of society and sustainable development, and his continued commitment to problems of population and poverty, loss of biodiversity, and conservation. Dasgupta is a preeminent economist and author of 23 books and nearly 300 articles, many of which are considered paramount in their field. He is widely recognized for major contributions to the theory of “sustainable development,” initially published long before the term became prominent in the 1980s, with his study of the concept of optimum population, beginning in 1969. Early on, Dasgupta recognized the ethical priorities of existing populations over future “potential” people and considered social dynamics from the perspective of individuals within the larger whole, such as individual choices about whether or not to have children. He argued for population studies from the perspective of “generation-relative utilitarianism,” which is built on the recognition that reproductive choices made by one generation affect not only those who do the choosing but influence the quality of life of the next generation as well. This became a trademark of his work, making connections between the micro and the macro for a greater understanding of the two. Also of central importance was Dasgupta’s path-breaking research in the 1970s with Geoffrey Heal on the optimal depletion of non-renewable resources. Turning the depletion problem on its head, Dasgupta and Heal for the first time looked at resource depletion as a societal matter, loaded with ethical and inter-generational implications. Among the issues they explored was the set of conditions needed for a society to maintain rising per capita consumption despite relying on exhaustible resources. They also explored the role of innovation and the way that technical change, in addition to capital substitution, could alleviate the constraints imposed by essential resources being in finite supply. Dasgupta is admired for his intellectual work bridging the gap between environment and the human condition. “Sir Partha understood well before most others how poverty, population, the use of natural resources and biodiversity are intimately interconnected, and how policies addressing one without due attention to the others will fail,” said one of his nomination supporters. Dasgupta championed an integrated approach to environmental economics. As Chairman of the Board of the Beijer Institute from 1991-1996, he along with the Institute’s Director, Karl-Goran Maler, brought together leading economists and ecologists to jointly address problems that had never before been considered by partners across the academic divide. Through Dasgupta’s intellectual leadership, the interdisciplinary collaboration and scholarship yielded significant contributions to both fields. Concepts of well-being continued to develop throughout Dasgupta’s research. His 1993 book, An Inquiry into Well-Being and Destitution, applied his approaches to population theory to the poor, the so-called “bottom billion.” Echoing his previous work, Dasgupta’s investigations into destitution explored the complex lives of marginalized people and the social constraints that often confine them to “poverty traps.” His findings were distinct from the prevailing orthodoxy of the time and countered perceptions that liberalization and economic development of a society could singlehandedly amend the lives of the poor. In 2001, his book Human Well-Being and the Natural Environment further extended theories of well-being into the context of sustainable development. Dasgupta showed that the relevant measure for evaluating sustainable development is intergenerational well-being, and that the relevant rule for assessing this realization is whether wealth, including environmental and other non-priced assets, is non-decreasing. He argued that measurements of “inclusive wealth” must incorporate population, natural resource use and social capital in addition to more conventional constituents of well-being. Dasgupta also showed that although some countries have accumulated a great amount of economic and social capital, in doing so they have lost natural capital by depleting non-renewable resources. Some of the first inclusive wealth accounting of nations was generated by Dasgupta and his peers, analyzing 140 countries in a landmark 2014 report. While estimation of inclusive wealth is still at an early stage, the work has shown that environmental condition and natural resource assets are vital in national accounting of a country’s progress and capital base. Without such comprehensive valuations, what we see as success today may only be a down payment on failure tomorrow. Dasgupta’s research has been transformative both within academic contexts and by transcending academia to help shape governmental, intergovernmental and religious policies, practices and positions. Dasgupta’s efforts to bridge collaborations across the ecology and economics communities inspired in part the Millennium Ecosystem Assessment. Beginning in 2000, the Assessment was a large multi-year effort involving over 1300 scientists worldwide, conducted under the auspices of the United Nations with the objective to assess the consequences of ecosystem change for human well-being and to establish the scientific basis for actions needed to enhance the conservation and sustainable use of ecosystems and their contributions to human well-being. Dasgupta served on the leadership team, with ecologists and economists co-chairing the working groups to cut across sectors and incorporate natural science and social science perspectives into global, sub-global, regional, national, basin and local evaluations of environment and society. As a whole, Dasgupta’s research has revealed more than that of any other economist the complex and sometimes hidden relationships involving population, natural resources, poverty, and the environment. In supporting Dasgupta for the Prize, one colleague described him as “likely, the economist who has done the most to analyze the human predicament combining hard science and equity issues with the best of economic analysis.” His wide-ranging scholarly contributions continue to influence major aspects of sustainable development such as the economics of science, innovation, and technical progress; and the organization of communities, particularly as regards the management of common property resources, which comprise a significant share of the capital base exploited by the rural poor. Dasgupta earned his B.Sc. in physics from University of Delhi; his B.A. in mathematics from University of Cambridge; and his Ph.D. in economics from University of Cambridge in 1968. He has served as Chairman of the Economics Department at the University of Cambridge and President of the Royal Economic Society, the European Association of Environmental and Resource Economists, and the European Economic Association. He is a Knight Bachelor, recognized by Her Majesty Queen Elizabeth II for ‘services to economics’. A recipient of the 2002 Volvo Environment Prize and the 2015 Blue Planet Prize for Scientific Research, a Fellow of the Royal Society and a Foreign Member of the US National Academy of Science, Dasgupta received the European Lifetime Achievement Award in Environmental Economics in 2014. Dr. Partha Dasgupta was nominated for the 2016 Tyler Prize for Environmental Achievement by Dr. Simon Levin, George M. Moffett Professor of Biology at Princeton University; and also by Dr. Scott Barrett, Lenfest Earth Institute Professor of Natural Resource Economics with the Earth Institute at Columbia University. As described in Dr. Levin’s nomination letter: “What distinguishes Sir Partha among all economists is his commitment to issues of poverty and the environment. In that category, I think that he has unquestionably been the most important environmental economist in the world”. The nomination was supported by the Honorable Dr. Jane Lubchenco, U.S. Science Envoy for the Ocean; and Drs. Harold Mooney, Paul S. Achilles Professor of Environmental Biology, and Paul Ehrlich, Bing Professor of Population Studies and President of the Center for Conservation Biology, both of Stanford University. They and colleagues herald Dasgupta’s contributions as “extraordinary in many fundamental areas related to science and human well-being”, and cite him as a thought leader in initiatives toward improved environmental stewardship, increased equity and a rise in the well-being of peoples worldwide.